The crew dives deep into Japanese mythology (sort of) with our discussion of Yamato Takeru (Orochi the Eight-Headed Dragon). We are back with our third episode of March! And, yes, I realize that this technically is getting posted on April 1st….but it’s not a joke – the new episode is here and we are talking about Yamato Takeru, Toho’s semi-remake of their 1959 film Birth of Japan but focusing on the Japanese legend of the same name. Released in the US as ORochi the Eight-Headed Dragon, this film holds an interesting place in kaiju cinema due to it’s mythological connections to what is essentially Japan’s religious origin story. We also jumped into our second elimination round for Monster March Madness (see the results below), with so many contenders being knocked out of the competition, how will the next rounds fare for these monsters of mass destruction?? Tune into the next episode to find out! 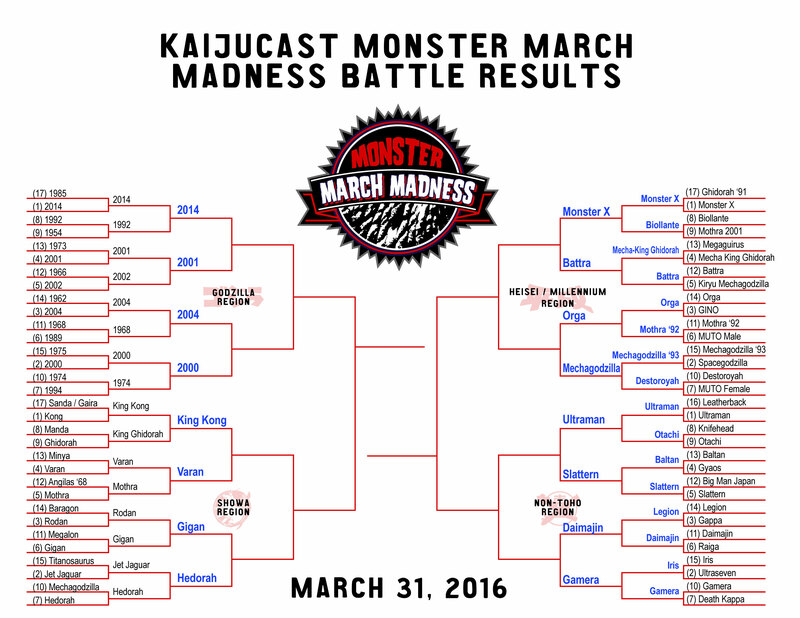 Click to view large version of our 3/31 Monster March Madness results! 2014 vs. 1992 — 2014 WINS! 2001 vs 2002 — 2001 WINS! 2004 vs 1968 — 2004 WINS! 2000 vs 74 — 2000 WINS! King Kong vs. King Ghidorah — King Kong WINS! Varan vs. Mothra — Varan WINS! Rodan vs. Gigan — Gigan WINS! Jet Jaguar vs. Hedorah — Hedorah WINS! Monster X vs Biollante — Monster X WINS! Mecha King Ghidorah vs Battra — Battra WINS! 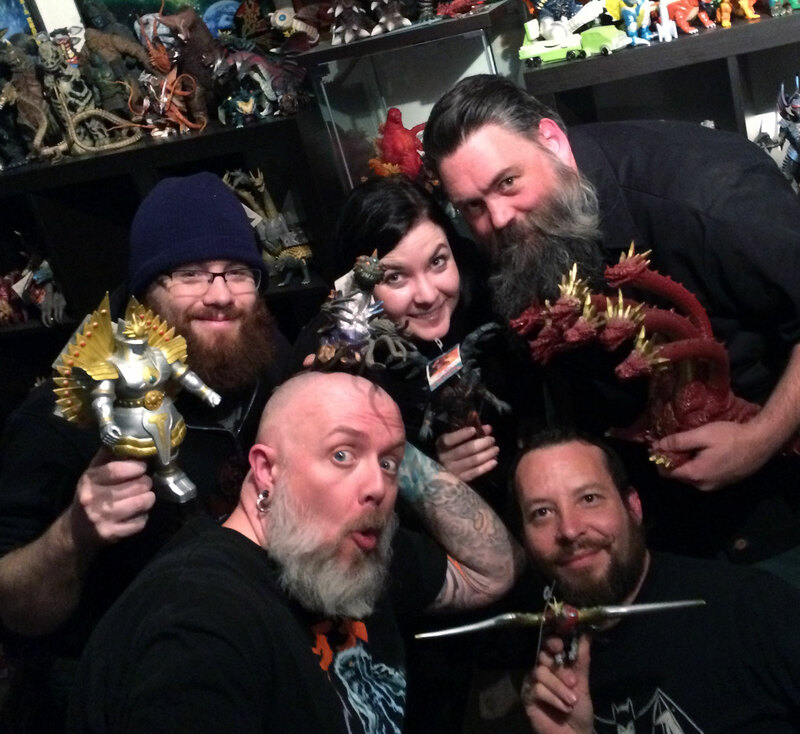 Orga vs Mothra 92 — Orga WINS! Mechagodzilla 93 vs Destoroyah — Mechagodzilla WINS! Ultraman vs Otachi — Ultraman WINS! Baltan vs. Slattern — Slattern WINS! Legion vs. Daimajin — Daimaijin WINS! Gamera vs Iris — Gamera WINS!